Past President Richie McInall Snr played in three finals and his son Past President Richie McInall Jnr was in two finals. On Friday evening two single finals, the Boyd and Handicap were played with our main day the Saturday hosting four finals. 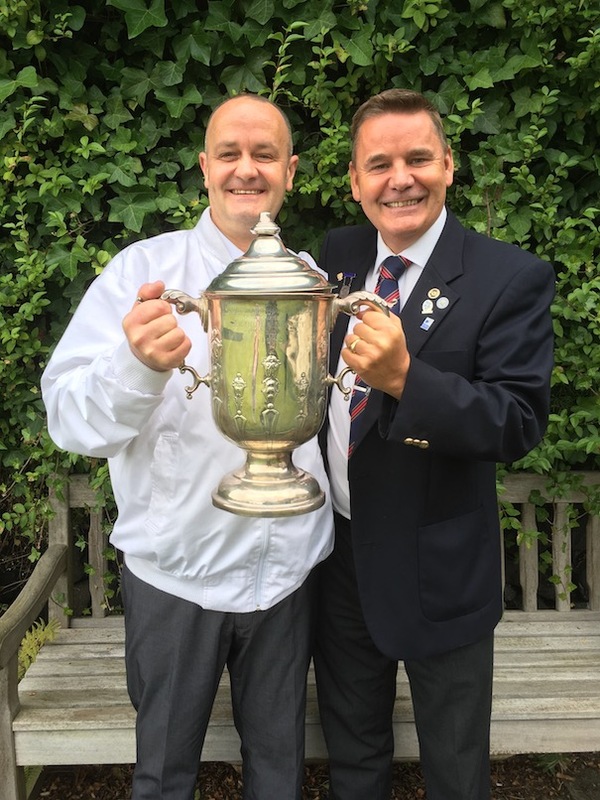 The Championship, Presidents, Seniors and Noble competitions. Leaving Sunday to host the Nominated Pairs final. The main event of course was the Championship where Richie McInall Jnr was playing four times club champion Craig Jamieson. 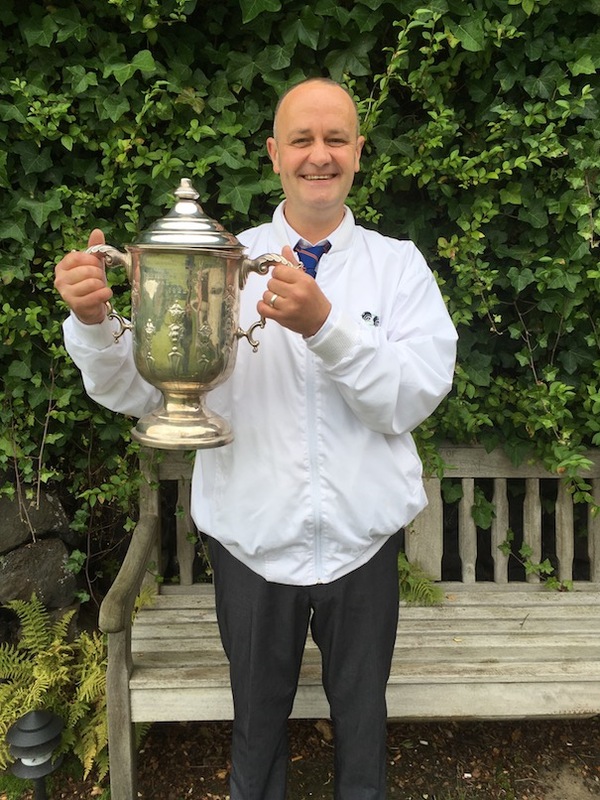 Congratulations to Craig Jamieson on winning the Club Championship for the fifth time. Past President Richie McInall sen. won the President's and Boyd trophies. 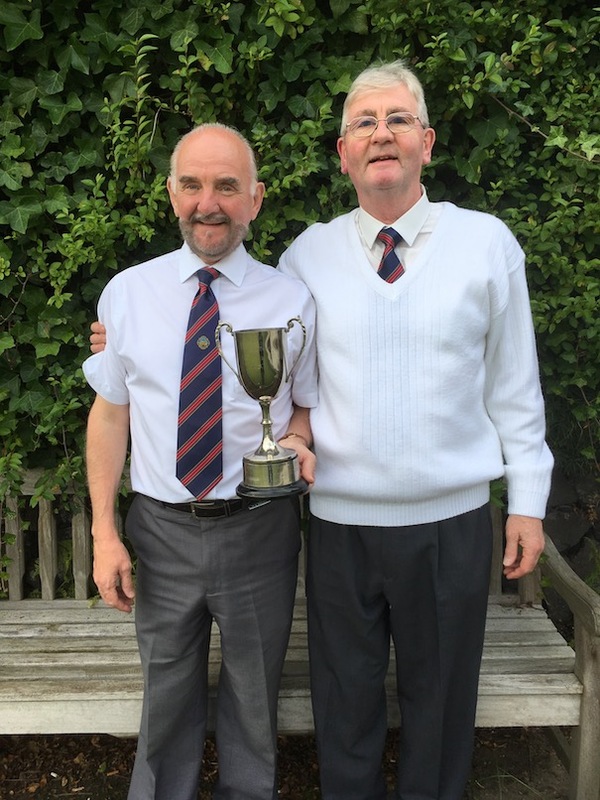 The Handicap trophy was won by Past President Richie McInall jnr, the Noble tophy was won by John Hill and the Seniors trophy was won for the third time by Past President Will McArthur. 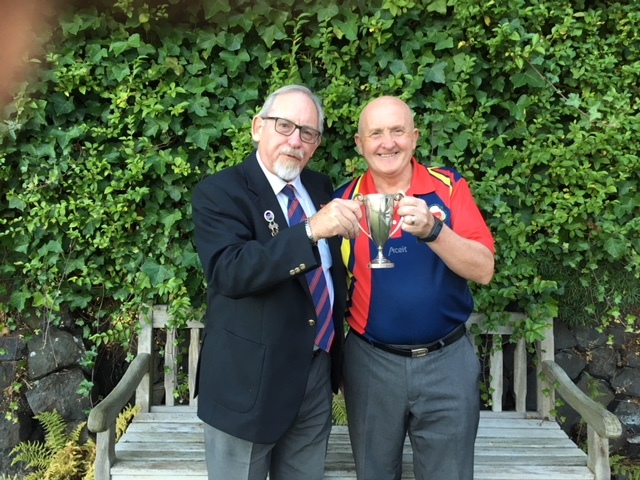 The Nominated Pairs was played on Sunday afternoon and after seventeen ends the win was settled by a measure at the last end for John McLaughlan and Richie McInall sen. to win 15-14. Our thanks to the match convenor Alan Johnston for organising the day and thanks to Hon.President Ian Skillen for his umpire duties. Father and son Past Presidents Richie McInall jnr and snr. 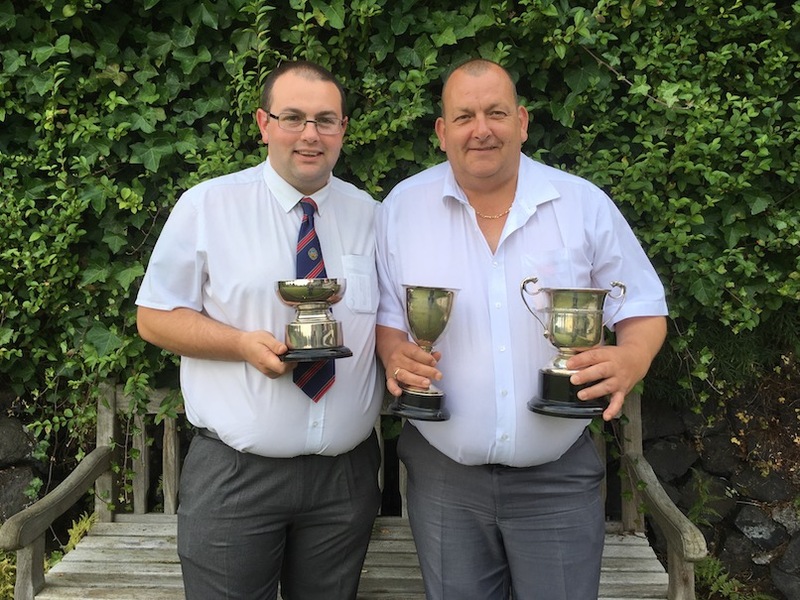 Richie snr won the Presidents and Boyd trophies along with the Nominated Pairs. Richie McInall sen and John McLaughlan. last end to get a win 15 shots to 14. 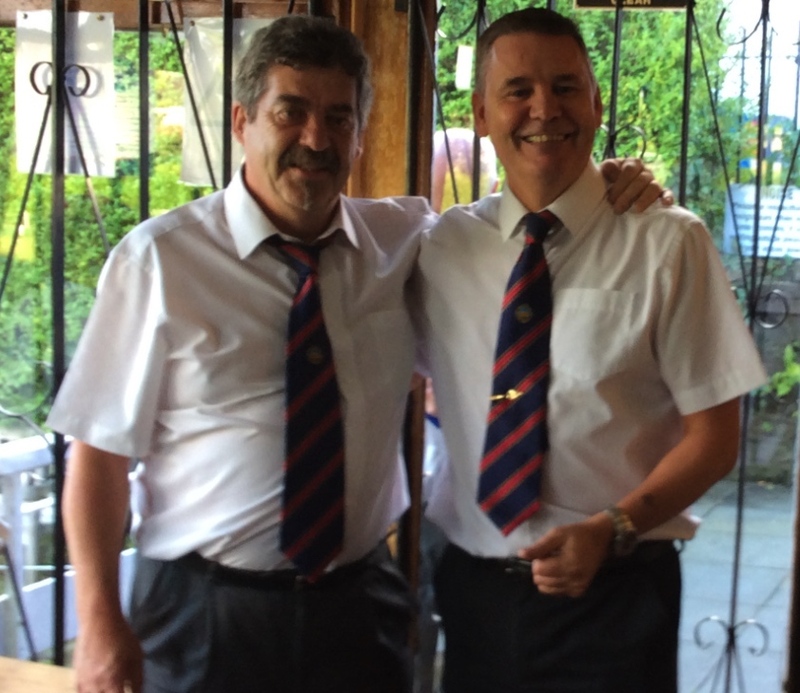 Balloted Pairs tournament took place on Saturday 30th September where we had a twelve team draw. 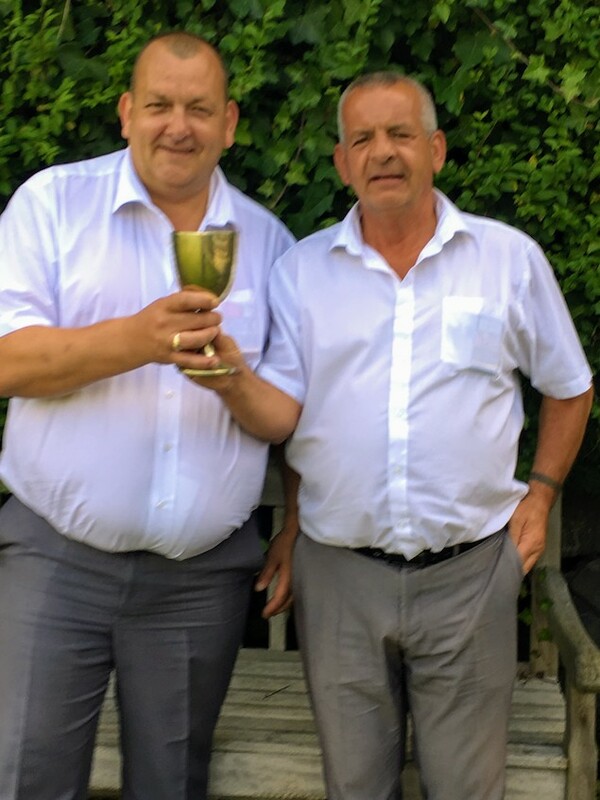 After an excellent day, good weather and green in top condition the winners were Hon.President Ian Skillen and Ralph Caldwell. 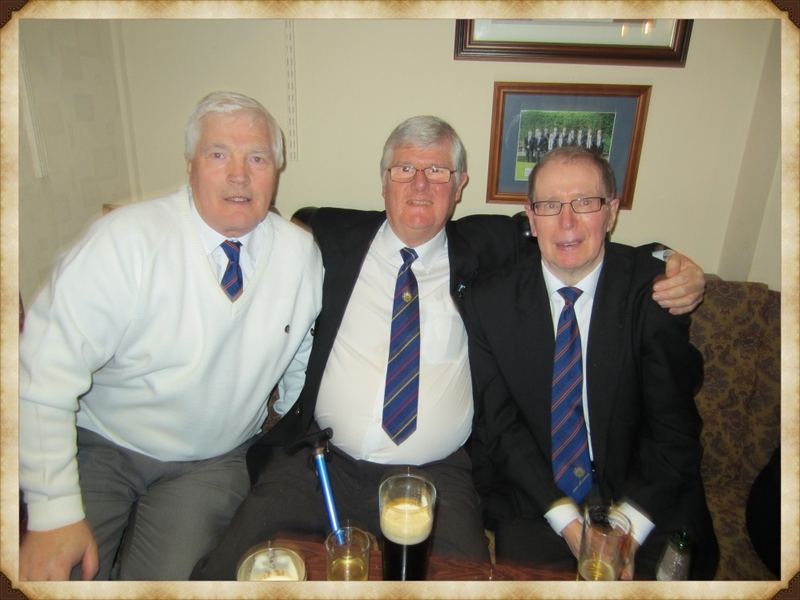 A photo I took of Jimmy Marshall with two of his many pals at Cambuslang BC taken on 2014 opening day. Sadly after a long illness with Parkinson's disease Jimmy died in the Glasgow Royal Infirmary in the early hours of Saturday morning on the 04th of November. 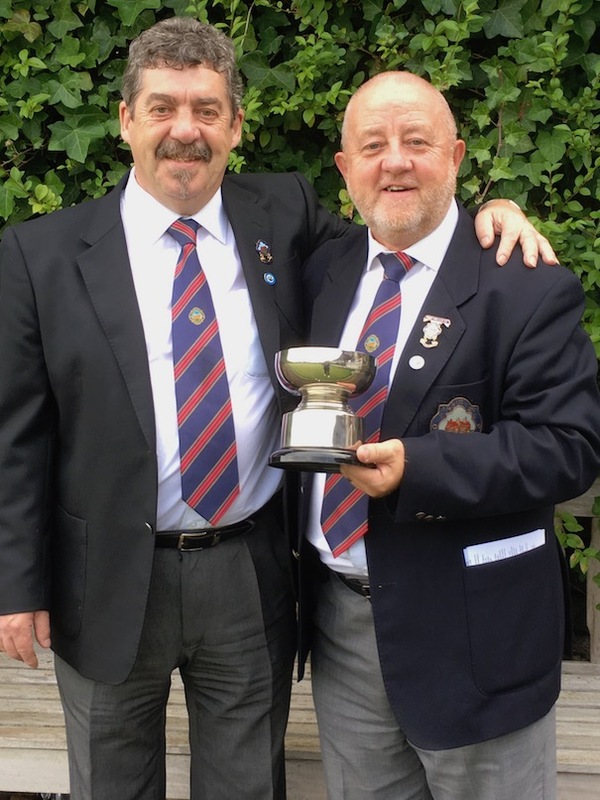 Jimmy had been a member of the club for over 31 years having joined in 1986 when John MacFarlane was the then Club President. Jimmy was a character and his stiff upright mode of walking got him the nickname 'Sgt.Major'. He had many friends in the club especially his Friday night mates who he regularly played dominoes with and by all accounts he was a canny player. Robert Burns, Bob Clark, Brian Hughes, Robert Park, John MacDonald, Ian Skillen to name but a few had many a Friday night tussle with their old pal. 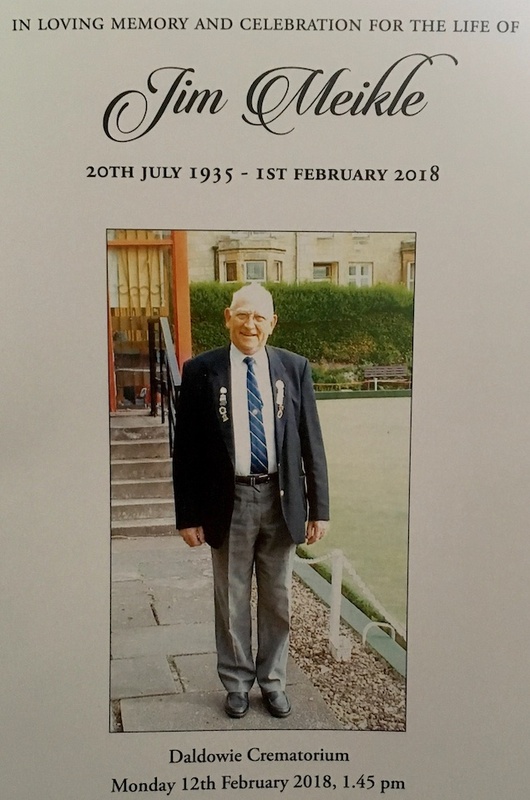 Unfortunately a couple of years ago his health deteriorated and he was taken into Rodger Park Care Home A lovely man who will be fondly remembered by everyone at Cambuslang BC. Our sincere condolences go to his family. Jimmy Marshall middle row, third from the right. 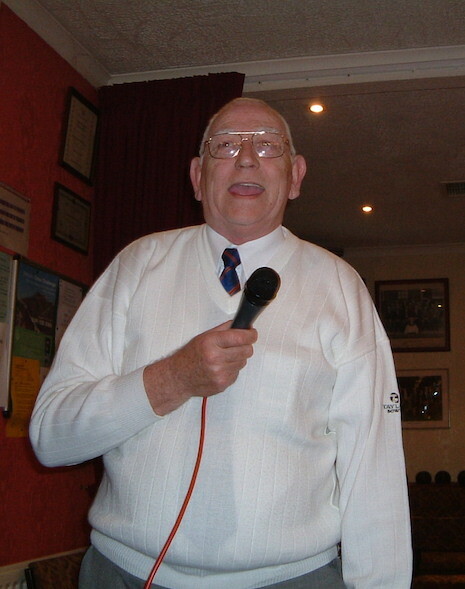 Big Jim singing at the 2004 club opening day. 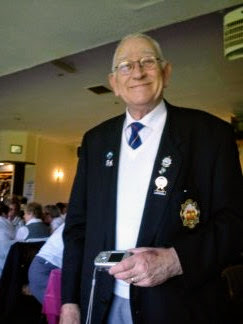 Sadly our longest serving member Jim Meikle died on the evening of 1st Feb. after a long illness. Jim joined the club we reckon in 1964 which was 54 years a member! 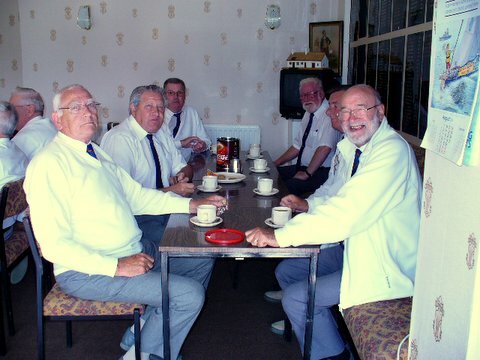 He had many many friends in the club and was also well kent at various other bowling clubs. He and his wife Past Lady President Cathie were ever present at our cabarets where they were joined by lifelong friends Past President Jim Low and his wife May Low. 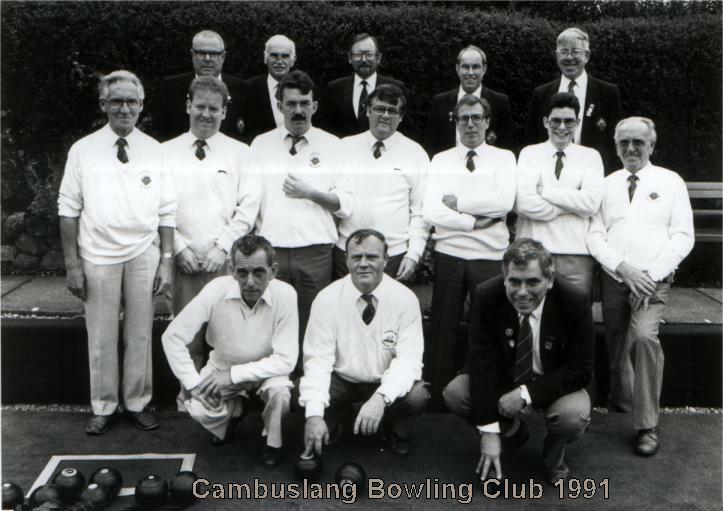 Jim was a proud Cambuslang B.C. member and he will be buried in his club blazer, shirt and tie. 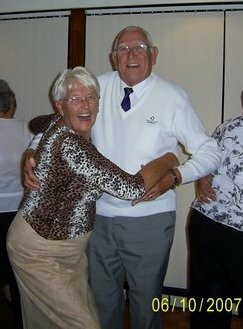 A lovely big man who will be fondly remembered by everyone at Cambuslang B.C. Our sincere condolences go to his wife Cathie and the family. 1.45 at Daldowie on Monday 12th February, then back to the bowling club. All photos © Past President Will McArthur .